Apple states that iCloud requires OS X 10.7 Lion on Macs and iOS 5 on mobile devices. The latter is no problem, because you can upgrade your devices from earlier versions free of charge. A Mac operating system upgrade is a much bigger deal, and if you have reasons for sticking with OS X 10.6 Snow Leopard - one possibility being that your machine isn’t compatible with Lion - this will be a cause for concern. Optimists will point to a much-circulated System Preferences screen grab, of which MacRumors has a copy at bit.ly/HlfRtl, which suggests Snow Leopard is set to gain iCIoud support with an upcoming 10.6.9 update. That would be great, but if the rumour turns out to be incorrect, you’re going to have to look for workarounds. You’ll need an iPhone, iPad or iPod touch running iOS 5 or later to set up your account. Tap Settings > iCIoud > Sign in with an Apple ID > Use iCIoud. With your account now set up, go back to your Mac and enable the services that will work with Snow Leopard. iCIoud email accounts, which carry over from MobileMe, will work in any regular email client. Add yours by opening Mail > Preferences > Accounts and using your exist­ing MobileMe login credentials to set up a new account. Mail should detect the server address and complete the bulk of the setup for you. Even Lion can only access your iWork for iOS docu­ments via the browser, so in this respect Snow Leopard is on the same level. We’ll have to wait for Mountain Lion to take full advantage of Documents in the Cloud. They’re also neck and neck where Find my iPhone/iPad is concerned, but you can’t track a lost non-Lion Mac. Add yours by opening Mail > Preferences > Accounts and using your exist­ing MobileMe login credentials to set up a new account. When it comes to cal­endar and address book syncing, things are techni­cally possible but a little more complicated. Various users have man­aged to deconstruct the subscription links so that they work in iCal on OS X 10.6 (see the thread on Applelnsiderat bit.ly/lDYY21), but a neater solution may be to install an alter­native app, such as BusyCal (busymac.com/busycal), which requires OS X 10.5 or later; this extends iCIoud calendar support as far back as Leopard. You can hack Snow Leopard’s Address Book using the Terminal to get it work­ing with iCIoud (see the Hsiaoi Collection post at bit.ly/llnHIB), or try connecting directly by setting up your iCIoud contacts as a CardDAV server. Go to Address Book > Preferences > Accounts and click the'+’ to add a new account. 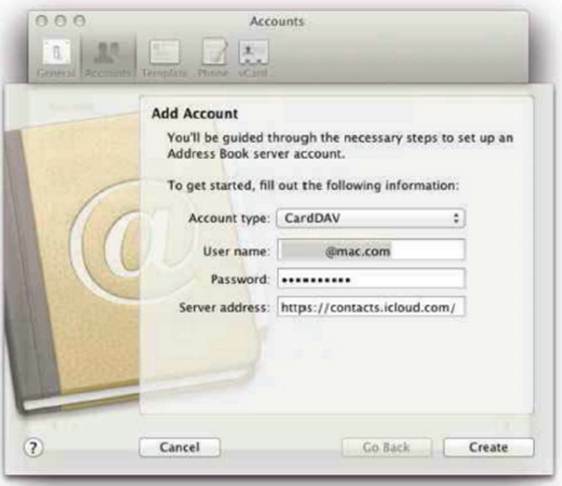 Choose CardDAV as the account type, enter your full iCloud email address and password as your user name and password, and specify https://contacts.icloud.com/as the Server address. In our tests this took a short while to validate, but then drew down our contacts successfully to our local OSX Address Book.